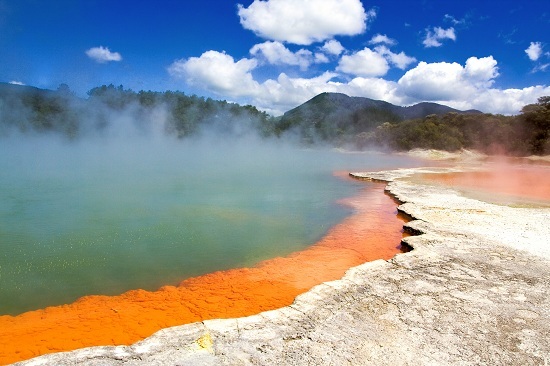 Emma shows us a different side to New Zealand with a guide to unusual things to see and do. So you're looking to go to New Zealand? And you know full-well there are lots Lord Of The Rings sights to see, beautiful scenery to marvel at and tonnes of adventure activities to do. But what if you want to see something that little bit different? New Zealand, as we know, is home to a range of natural wonders and believe me you will spend your entire time here in awe of sights like Gloworm caves and vast mountain-topped skylines…but I recommend checking out this unusual sight at the tip top of the country. From the view of the lighthouse at Cape Reinga you can see where the Tasman Sea and Pacific Ocean meet. Watch as the two rival waters clash together in choppy waves and make sure you look out for the contrasting colours of the seas….I’ve never seen anything quite like it. Arriving in this volcanic land I couldn’t get over the dinosaur-like landscape that dominates this city. Maybe because I’ve never seen the hot springs of Iceland close before, but I was completely amazed at the sight of the volcanic bubbling ponds of mud before me. I remember my first time I walked through the misty pathways of Kuirau Park and I genuinely expected there to be dinosaurs in there. Me and a passer-by looked at each other in utter disbelief as we took pictures and exclaimed ‘I cannot believe this place is real, are we in Jurassic Park?!’. I really recommend going to the World of Wearable Art Museum in Nelson. It’s heaven. WOW shows off a kaleidoscope of colourful quirky outfits made out of materials like wood, plastic and even recycled bottle caps. The idea was for the world’s artist’s to create ‘wearable art’ to be shown off every year in a grand Lady-GaGa-like show. I loved it! It was super inventive and offered a great insight into how many talented artists there are. Once you’ve had enough of the girly stuff you can go check out the more masculine muscle cars next door – it’s a win/win visit for girls and boys alike! There are over 100 cars to see ranging from Austin Power’s ‘Shaguar’ to a range of classic Cadillacs and Bentley’s - I was taken away by how beautiful these bad boys actually are up close. The rock n’ roll Cadillac’s were definitely my favourites! Conscious of what to do with your time in New Zealand? Well how about going to a clock museum? Yup I had to check out Clapham's Clock Museum when I was in Whangarei, it just sounded too kooky! The museum is named after the founder of the collection, Archie Clapham, a Yorkshire lad who moved to NZ in 1903 and brought his crazy collection of clocks with him. He managed to accumulate a collection of 400 clocks and music boxes. I cannot believe he fitted all these clocks in his living room! He even opened up his home for viewings before moving them here...(I bet his wife was so happy!). Calling all Rocky Horror fans! You can pop over and visit Richard O’Brien in Hamilton if you fancy. 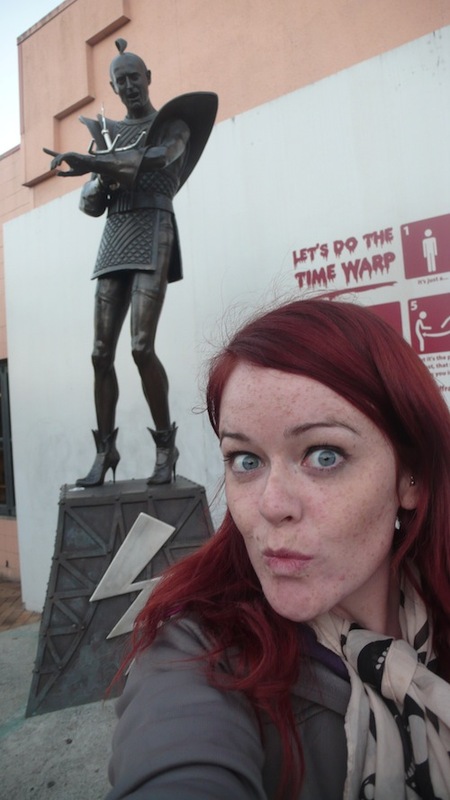 Being a huge fan of the Rocky Horror Picture Show I thought the statue was great fun to see and was in fact my only reason for stopping in this town. The statue is of Richard’s character Riff Raff was put there to mark the spot where O’Brien found his inspiration to write the cult show’s script. Also if you fancy taking silly pics of yourself in front of it, like I did, you will realise that all eyes are on you – there is a ‘Riff Raff’ camera that beams images 24/7 to the statue’s official site…so even all your mate’s back home can say hi! Emma is a TEFL-teacher-in-training and blogger, writing regularly for her site Gohemian Travellers and The Huffington Post. She travels the world solo in search of offbeat sights and excuses to dress up in OTT outfits. She is planning to re-locate to Japan next to immerse herself in all things Hello Kitty. If you'd like to discover more unusual attractions in New Zealand, take a look at our holidays to New Zealand and cheap flights to New Zealand from just £749.